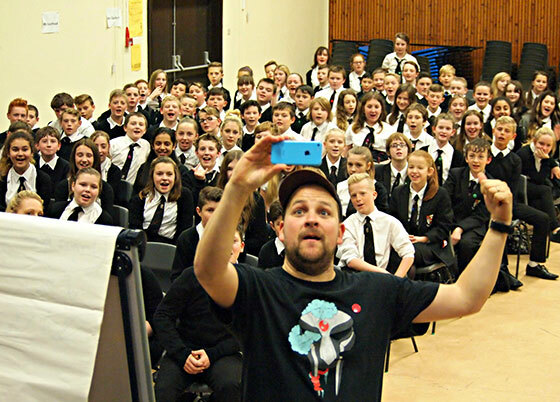 In October 2015 the Scottish Friendly Children’s Book Tour visited secondary schools in North Ayrshire, East and West Dunbartonshire with the brilliant author and spoken word artist Steven Camden. Over the course of a jam-packed week Steven shared his infectious enthusiasm for storytelling with over 1200 pupils from 10 different schools. 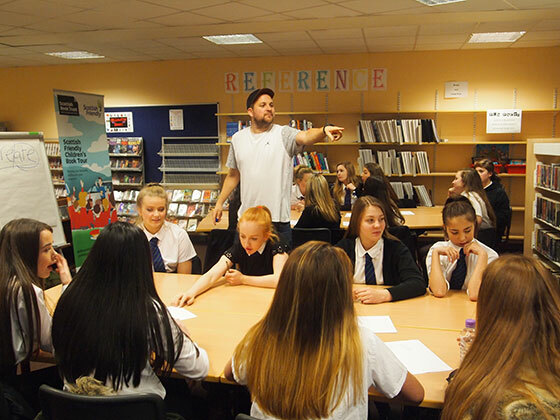 He encouraged pupils to share their ideas and gave them an insight into his own writing process. After Steven’s visit pupils were left buzzing. As one school librarian said “Steven was inspirational – I have worked in children’s libraries for 36 years and I have never seen young people respond to a book event so positively”. Whilst on the road we quizzed Steven about books, films and fantasy dinner guests. Read on to find out more. . .
A. I reckon Kurt Vonnegut would be fun at dinner. A. I Want My Hat Back by John Klassen and then The Witches by Roald Dahl. A. I’d like to work demolition by day and become an animal rights vigilante by night. A. I have stories, pictures and comics that my children have made. They’re important. I have a few t-shirts that have sentimental value, my music collection, to be honest there’s not much I couldn’t live without. A. Fred Savage from The Wonder Years. A. Too many. I was very lucky to grow up surrounded by amazing hilarious characters. I could write twenty books just listing memories. A. The 1960s. A time of hope, experimentation and perceived freedom that I think yielded amazing things. A. One Flew Over the Cuckoo’s Nest by Ken Kesey, Self Help by Lorrie Moore or maybe The Outsiders by S.E Hinton. A. Don’t listen to advice. And finish things. A. A house with a garden.